It rained briefly this morning this morning, but Flopsie continued to sit out under the bushes as if it everything was fine. 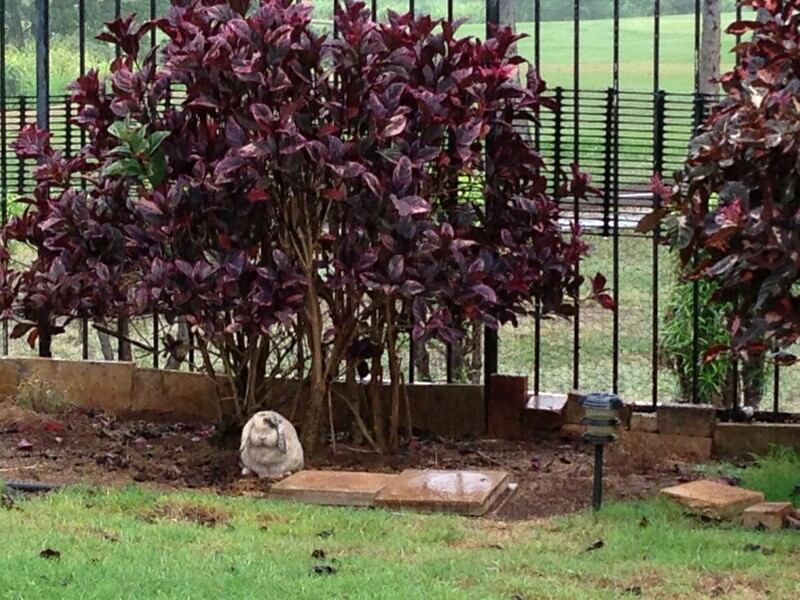 Mopsie ran onto the lanai to wait out the rain. He only came in from the rain when he saw his brother getting raisins on the lanai. 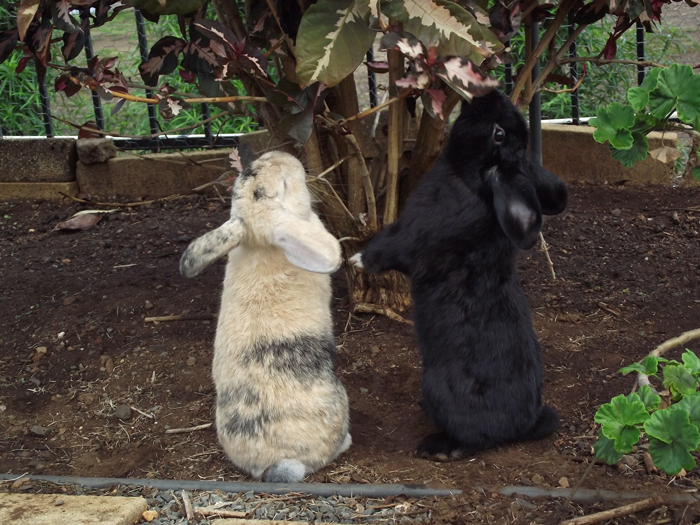 After they outgrew their exercise pen, we apprehensively put Flopsie & Mopsie outside in the larger yard that had been reinforced with extra fencing. Like before, everything was OK for maybe a day and a half, but then they started escaping out of the yard TOO. It seemed that no matter where they were, they wanted to be somewhere larger. My husband would be sitting down in the living room in the afternoon and hear a knock on the door. It would be either our neighbor or her daughter, (not the ones with the pit bull) saying that one or both of the rabbits were in their yard. So he would bolt out of the house, sometimes grabbing our son, and go out there with the fishing net to chase them. One embarrassing morning, he had to explain to the golf course maintenance worker that he was out there chasing down his rabbit. The man laughed and said, Good luck, brah! And drove off. The most stressful time was when we had to go to the neighbor islands one morning and had a 6:30 flight. At 4:30 I went out to the lanai to feed them and discovered Mopsie missing! Now, a black rabbit at night is almost impossible to see, so my husband and I grabbed flashlights and ran out onto the golf course. We found him frozen in the glare of our flashlights, on the edge of the yard with the pit bull which fortunately, was not out. “He’s over here, under the bushes,” my husband said in a loud whisper. I called to him softly, “Mopsie, Mopsie, come here boy,” but he hunkered down, refusing to budge. I found myself resorting to picking up an extremely large coconut tree branch to sweep him out from there. It had a surreal quality to it. He ran through their yard and then back into ours through a hole in the fence. This incident alone took 10 years off our lives. For the time being at least, the escapes have stopped, as my husband has finally managed to secure the yard, or so we hope. For all we know, they may be slipping out at night, hitting the nightclubs, and then slipping back inside before dawn. The alternative is to keep them caged all the time but we enjoy seeing them sprinting around the yard, leaping into the air for no apparent reason, and grazing on the grass in the evening like little cows. The joys they give us outweighs the occasional heart attacks! 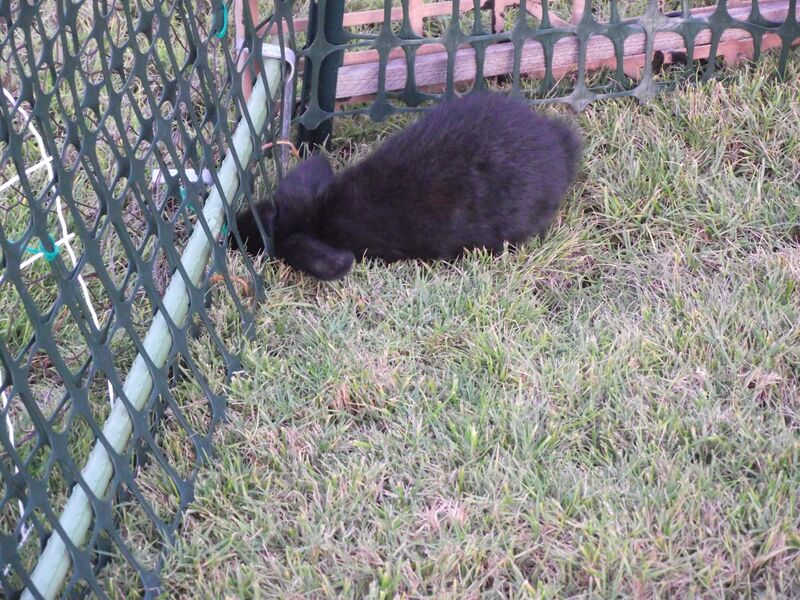 After a few days of being in their exercise pen, Flopsie & Mopsie discovered they could poke their heads into the netting which had holes about an inch-and-a-half wide and squeeze their way out. “The rabbits are out, the rabbits are out,” became a familiar cry. “Get the fishing net, get the fishing net,” I would yell. It was like a circus as we ran around the yard chasing them. My husband would have to use the fishing net to scoop them up, and dump them back into their playpen. So it was back to the hardware store for another roll of netting, wrapping it around to make a double layer so they couldn’t pop their heads out. Then they discovered they could squeeze their way UNDER the netting or chew their way out with their tiny but razor sharp teeth. My husband was determined however so he bought a roll of metal fencing this time, staking it into the ground and wrapping it around the playpen to make a third layer. He also made the fence higher, because a Google search said that a 3 foot high fence was optimum for keeping rabbits out—although in our case, we wanted to keep them IN. They kept popping out like popcorn however and we kept having to chase them. Afterwards my husband would look for the holes, patch them up, and gleefully say, “OK, this time I got it fixed for good!”—only to have them escape the next day. One day we saw them clawing their way UP the fencing, teetering on the edge, and falling over to the outside and freedom. Who knew that rabbits could CLIMB? They looked like little monkeys! So it was back to the hardware store, this time for bird netting to drape over across the top of the playpen. It began to look like an armed camp or the shelter of a homeless person. Well, things settled down for a while, but as they grew larger and with the exercise they were getting in their playpen, their hindlegs grew stronger. One day we found them taking a running leap onto the footstools that served as their shelter, and bounding through the bird netting out of their playpen into the yard. Our jaws dropped: “Did you see that, did you see that? !” we exclaimed. It was an amazing feat of acrobatic agility. 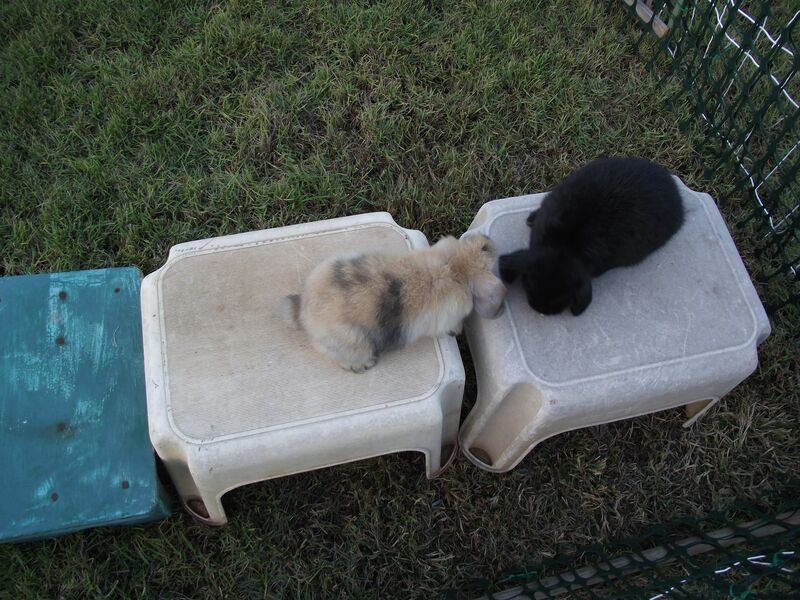 They used the footstools as launching pads to get out of their fenced area. I decided that the playpen wasn’t working any longer and that they needed to have the run of the entire backyard which was bordered by a wrought iron fence leading to a golf course. The problem was that the bars of the fence were spaced too widely apart to contain the rabbits so I told my husband, You’re going to have to add fencing to it so that they don’t get out onto the golf course, or into the side yards of our two neighbors, one of which has a pit bull.